WASHINGTON – It happens every spring. At least, now it does. That all changed when I realized I could take my little cousins to see “Jurassic Park” for the first time. How exciting it’ll be to share the wonder and horror of Michael Crichton’s tale of “imagineer” John Hammond (Richard Attenborough), who’s found a way to extract dino DNA from mosquitoes trapped in amber (fossilized tree sap) to create living, breathing dinosaurs for his Costa Rican theme park. Before the park can open, Hammond courts the endorsements of a group of scientists, lawyers and philosophers. The guests include paleontologists Dr. Grant (Sam “Don’t Move” Neill) and Ellie Sattler (Laura “People are Dying” Dern); chaos-theorist Dr. Ian Malcolm (Jeff “Life Finds a Way” Goldblum); and Hammond’s two grandkids, Lex (Ariana “I’m a Hacker” Richards) and Tim (Joseph “I Think He Saurus” Mazzello). They meet up with a host of memorable park employees: a chain-smoking computer guru (Samuel “Hold Onto Your Butts” Jackson), a safari dino hunter (Bob “Clever Girl” Peck) and the corrupt Dennis Nedry (Wayne “You Didn’t Say the Magic Word” Knight), who kills the park’s power to steal its valuable embryos, only to set the creatures loose for a nightmarish night in the park. While the raptor-crate opening feels corny next to the horror of Chrissy’s last swim in “Jaws” (1975), the T-Rex Paddock remains one of the best directed horror sequences in history, as is the “Raptors in the Kitchen” climax. The rest is quintessential Spielberg, capturing the sci-fi wonder of “E.T.,” the archaeological morality of “Raiders of the Lost Ark,” the supernatural obsessions of “Close Encounters” and the killer creatures of “Jaws,” all with another awesome John Williams score. Not only was it the top grossing movie of 1993 ($694 million, No. 20 all-time adjusted for inflation), it came the same year Spielberg won Best Picture and Best Director for his masterpiece “Schindler’s List” (1993). How many directors can make the summer’s top blockbuster, then turn around and make the year’s top art film? I defy Fellini to make a hit blockbuster the same year as “8 1/2,” or Joss Whedon to make an art masterpiece the same year as “The Avengers.” Ironically, Attenborough joined “Jurassic” because he didn’t think his own directorial effort, “Gandhi” (1982), deserved to beat Spielberg’s “E.T” for Best Picture. This time, it was Spielberg who cast Ben Kingsley to win Oscar’s top prize. Still, my fear of an exponential Hollywood money grab is trumped by my desire to introduce new generations to film history. That’s what “Jurassic Park” is at this point, joining “King Kong” and “Star Wars” as the visual effects titans of the 20th century by creating cinema’s first living animals with CGI. Until that point, the effects wizards at Industrial Light and Magic (ILM) had only used computer graphics to create storybook characters (“Young Sherlock Holmes”), water monsters (“The Abyss”) and liquid-metal cyborgs (“Terminator 2: Judgment Day”). While Spielberg was inspired by the stop-motion dinosaurs in “The Lost World” (1925) and “King Kong” (1933), he told his visual effects team that he didn’t want a monster like Godzilla or Rodan. He wanted believable dinosaurs. Pre-production began with a combo of life-sized robots (the animatronic T-rex was a modern-day Bruce the Shark) and stop-motion miniatures (moving the dinosaur models one frame at a time). But when Spielberg saw the stop-motion tests, he still noticed the subtle, jerky movements. That’s when effects artist Dennis Muren convinced him to watch a CGI test of a T-rex chasing a Gallimimus herd. Spielberg recalls sitting down to watch the CGI test with stop-motion master Phil Tippett, who realized he would soon be out of a job, just like print journalists crushed by the technology of the Internet. 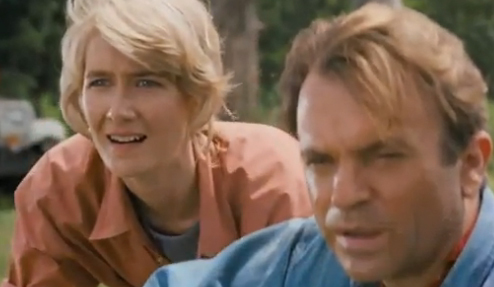 Classics like “Jurassic Park” should never be allowed to go extinct. While I despise the release of “Jurassic Park 4” next year, I hope we re-release the original classics as often as possible. There’s a difference between remaking and restoring. We should find every excuse to restore and re-release our great movies, whether it’s “Casablanca,” “Psycho” or “The Godfather,” updating them with the newest technology and restoring them for future generations. This is the beauty of restoration: it erases the false notion of “time,” just like reviving dinos from fossilized amber. Martin Scorsese spoke this Monday at the Kennedy Center’s annual lecture for the National Endowment of the Arts. As the first filmmaker invited to speak after years of authors, he said that for far too long, film has been looked down on as a poor substitute for literature. He countered that argument by noting that folks once said the same thing about literature, as Socrates thought reading and writing would become a poor substitute for memorizing knowledge. Scorsese’s point was that all eras fear new technology (i.e., Internet vs. library research), but we should embrace each phase as a new form of the same ongoing quest for enlightenment. This may explain his own 3-D attempt in “Hugo” (2011). Scorsese urged the restoration of *all* movies, even non-acclaimed flicks, saying there will be geniuses (i.e., Hitchcock) who make art masterpieces (i.e., “Vertigo”) or mainstream hits (i.e., “It’s a Wonderful Life”) that aren’t appreciated in their time, but that may one day be voted by critics as the greatest film of all time, as “Vertigo” recently was. “Jurassic Park” may never be considered in that academic class, but it is an undoubted 4-star mainstream classic. Take the family and rediscover the magic in IMAX. I promise the raptor screams and T-rex roars will make you cower in your seat like never before. The above rating is based on a 4-star scale. WTOP Film Critic Jason Fraley takes a chronological look at the best movie monsters.